The Bulldog GD400 Garage Door Lock is a DIY WEEK Security Product of the year winner. The lock is supplied with ground tube, fasteners, back plate and high security, removable, case hardened, anti-pick and anti-drill lock bolt. It fits most metal, glass fibre, plastic or wooden garage doors. The bolt on ‘L’ shaped bracket is typically installed on the outside of the garage door but can be installed on the inside. 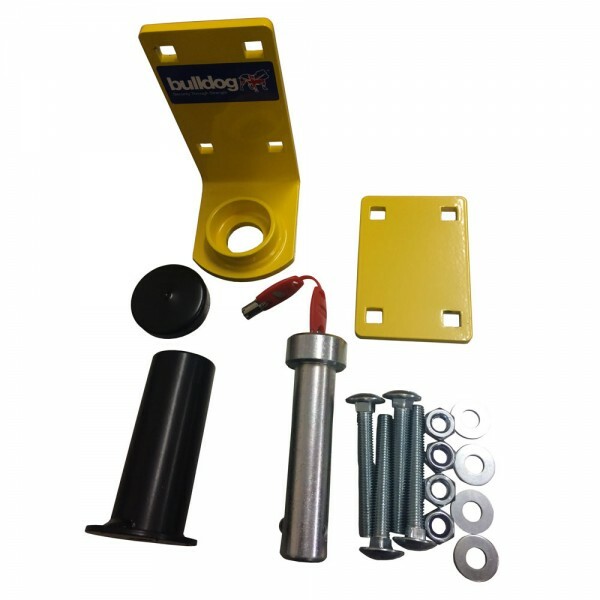 A reinforcing backplate is supplied in the kit to strengthen the garage door which is essential on thinner plastic and fibreglass garage doors. 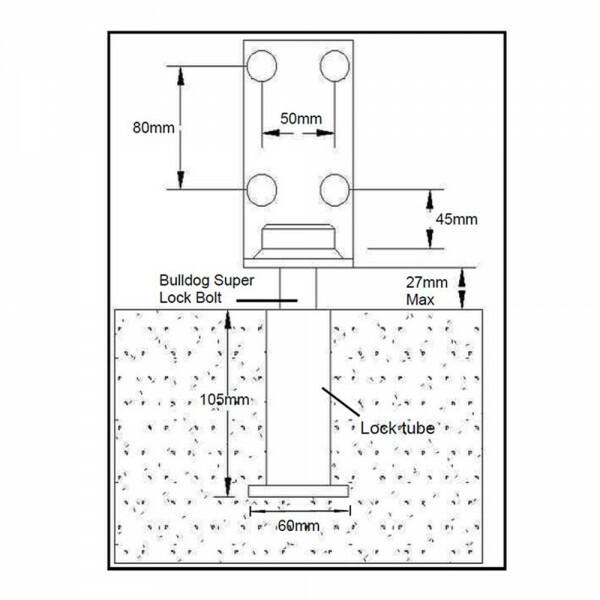 Like most Bulldog Security products the lock uses the tried and tested Bulldog Super Lock Bolt. No padlock is required. The coach bolts supplied are long enough for most wooden garage doors. 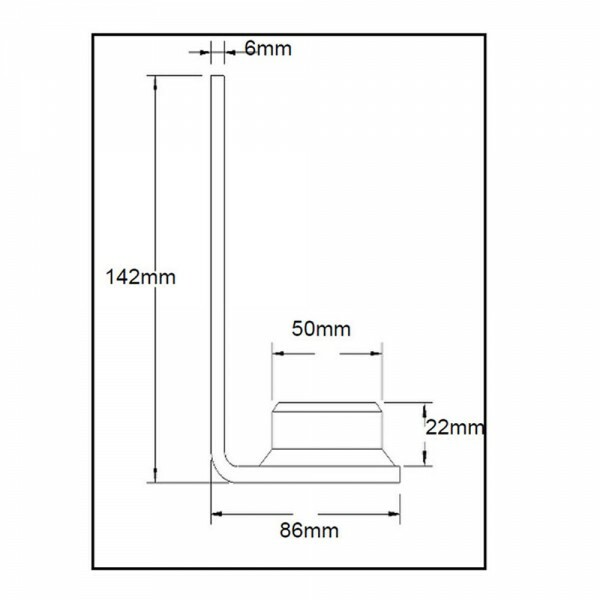 The ground lock tube fits flush to the ground when installed with no protruding parts. When locked, the garage door is physically held to the ground making prising of the door very difficult. A dust cap is provided to prevent dirt and dust ingress into lock and lock tube. The GD400 is finished in a highly visible yellow powder coating. 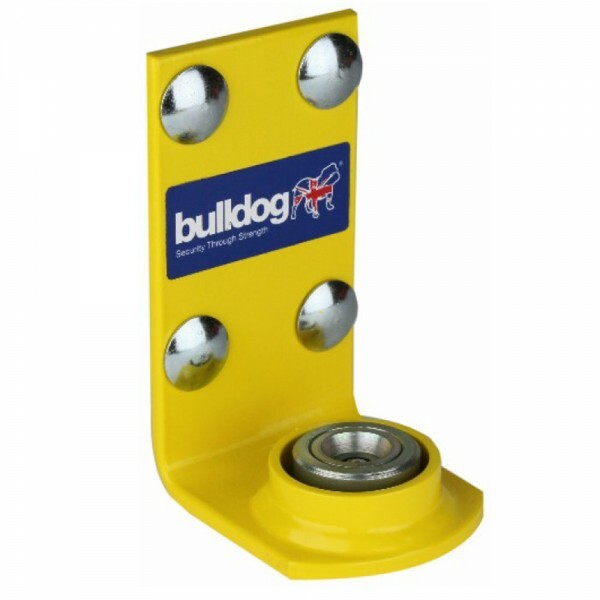 Bulldog's unique Locking Bolt mechanism has been developed to offer exceptional security without the disadvantage of using padlocks. The 1 inch (25mm) diameter locking bolt has a case hardened shaft, anti drill centre pin, and incorporates a 10 pin anti pick lock offering more than one million possible combinations. British manufactured and sold with Bulldog 5 year Guarantee. Great lock for the price! Well made and very robust. All the fittings necessary are supplied, together with simple, clear instructions. I've only given it four stars as I would have preferred a better quality traditional keyed lock, rather than the cylindrical one supplied, as the depth of the 'indentations' are not quite as varied as I would have liked for security. Generally the greater the variation in depth the harder it would be to pick. In the early days of cylindrical locks, when the diameter of the hole was much smaller, it was often possible to open such a lock with a biro! Having said that, it should not be taken that this lock would be so easy to pick, not a bit! The diameter of the hole is much bigger than the ones described above and the variation of the slots is much more varied and a bit deeper, so I'm sure it would easily defeat all but the most skilled thief with the right tools. The opportunist thief wouldn't have a chance defeating this lock by picking it and to get past it any other way would involve a lot of noise and probably portable power tools. I would thoroughly recommend this lock as a good compromise between cost, security and ease of use, in order to protect the contents of most garages. It takes a bit of effort to fit as you obviously need to concrete the locking tube's receptical into the ground, but it's not difficult and was all done in a couple of hours start to finish. Provided you appreciate that if someone REALLY wants to get in, they will, there is little out there to beat this lock for the price and believe me I looked hard! Oh, and it's made in Britain, what's not to like! Superb lock. Be prepared for a bit of hard work digging a hole and filling it with concrete, but it's worth it.